Oh my, ladies and gents! I ran across some PR info on this handbag house, m.Clifford Designs , created by Martha Clifford. It was founded in 2007 so it's relatively new. Martha's vision is at once funky and classic, providing you with a friend that won't end up in the closet in two weeks, nor for two years. I agree with her when she states that in these times especially, who wants, or needs, to chase trends? I mean, I never chase trends when it comes to my handbag purchases. I like styles that will withstand the test of time so that's why I don't mind investing a little dough in them. m.Clifford bags work, not just in terms of duration, but also in their prices. You won't just break the bank buying a m.Clifford bag , you'll hardly affect your budget. They make bags to be used, and that includes putting a cap on price points so that even their most expensive items, at $500, are a steal. But remember guys, we're talking investment pieces so although $500 seems pretty steep, expect to have the bag for years to come. If you do the math, it works out fabulously. 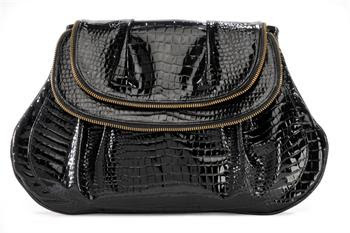 The Renee Black Alligator $200.00 - made of Italian leather....SWEET!!! Totally feeling the zipper details...tres chic! Check out mclifforddesigns.com for more chic handbags. As a fellow fashionista I agree that I never want to be a slave to the trends. I discovered M.clifford designs about a year ago and I can honestly say I fell in love. Her bags are made just as good as designer bags for half the price. I currently own the terrell in black and the bacall clutch.... I think we are going to see big things from this designer in the future!